My go-to answer, before we go any further: a group of 18 islands (17 of which have people living on them), which are located roughly between the North of Scotland and Iceland. They have their own postage stamps and are a part of the Kingdom of Denmark but are self-governing and have their own language (Faroese) although knowledge of Danish is also common there (as is knowledge of English in some circles). Most people in the United States (and a good deal of folk elsewhere) that I have spoken to have absolutely no idea where they are. This is why I thought I would write this post in my own words and develop my own introduction to the culture and image of the Faroe Islands, and why such things became a hobby of mine. Disclaimer: as of the time of writing, I have not visited the Faroe Islands, although one day I definitely hope to. Wherever you are on the islands, you are no further than five kilometers from the Atlantic Ocean. I will use this point to drive into the various images that the Faroe Islands has when abroad. One of these is sports. There are about 47,000 people who live on the Faroe Islands, even though there are more people than these who have knowledge of Faroese (mostly in Denmark). 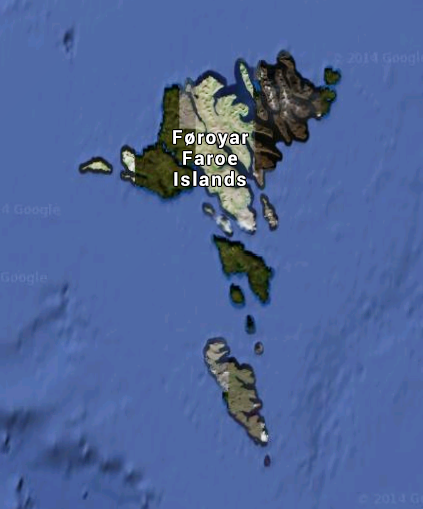 The Faroe Islands have a football (soccer?) team that is internationally recognized and, as such, represents the country at large-scale events like the World Cup and the Euro Tournament. Given their relative size to many of the other countries of Europe, you can imagine the sort of things that are said both by the Faroese and their opponents whenever the Faroese National Team wins a game. One of my friends in Germany told me that the Faroese National Team is not composed of professional players, but rather people from other professions that choose to undertake the sport as a hobby. Not only that, but soccer balls are weighted to avoid the likelihood that they will be kicked into the Atlantic Ocean. Another thing that the Faroe Islands is stereotypically known for is rainy weather, and a guidebook I read yesterday in the Columbia Bookstore advised that visiting the Faroe Islands at any other time than summer was ill-advised unless you are a “meditative” type. Because the islands themselves are not suitable for farmland, although are suitable for grazing sheep, the traditional food of the Faroe Islands has been consistent largely of sheep, birds, pilot whale meat, rhubarbs, and other slight fauna capable of growing in such an area. (Side note: the coat of arms of the Faroe Islands actually depicts a sheep). For those of you who would prefer a less graphic introduction to this side of the culture, I redirect you to this cartoon, courtesy of Scandinavia and the World. I’m glad we are away from that topic. The islands are also known for being quite heavily Christian, with many Faroese language textbooks teaching the primary source text about how Saint Ólav converted the Faroe Islands to Christendom. The national holiday of the Faroe Islands themselves is Ólavsøka, a two-day National Holiday (July 28th and 29th) named in his honor. There is also a beer associated with this festival as well. Now, I have already written a bit on the Faroese Language here. As an introduction for those of you who might not click on it: Faroese is related to Icelandic but is quite distant in terms of its pronunciation and is not mutually intelligible (except sometimes on paper). The grammar is of noteworthy difficulty and the pronunciation takes time getting used to. If you know another Germanic Language (especially a Scandinavian one), then Faroese will become a lot easier to come to grips with and the secrets of pronunciation of the other Scandinavian Languages won’t be secret anymore (the “g” before front vowels in Faroese [e.g. “I” or “E”] is pronounced like an English “j”, and in Swedish it is pronounced as an English y but with a hint of the Faroese “g”. This is just one example). It was recognized by Winston Churchill during World War II (he was the first to recognize the flag internationally) as a result of Denmark falling to Nazi Germany and the Faroe Islands (along with Greenland and Iceland) being occupied by Allied soldiers. Flying the Danish flag wasn’t acceptable any longer and so the “Merkið” (as this flag is called) became the substitute and stuck until the day. April 25 (note: Denmark fell to Nazi Germany on the 9th) is thereby “Faroese Flag Day”. The Faroe Islands also has a broadcasting service that is only in Faroese, and you can see it here. And allow me to sate the likes of you with some music. It may remind you of some Scottish music and points, and I am reminded of what TV Tropes said about the genetic makeup of those who inhabit the islands: the majority of the female genes are Scottish and the majority of the male genes are Norse. Draw your own conclusions. Anyway, are you going to close the page or are you going to treat yourself to beautiful songs you’ve probably never heard before? OH…I will announce the new language in the next post! It has fewer native speakers than any other native language I have studied to date. This is your clue.